If you’re a tech geek like me, you love Best Buy and all their latest gadgets. This weekend, I ventured into Best Buy looking for a new digital camera. As I walked into the store, I thought, “Wow, this place is empty, it must be a new Best Buy.” Then, it hit me, what once was a store filled with 20+ aisles of CD’s, and DVD’s had been replaced by just 2-3 rows. 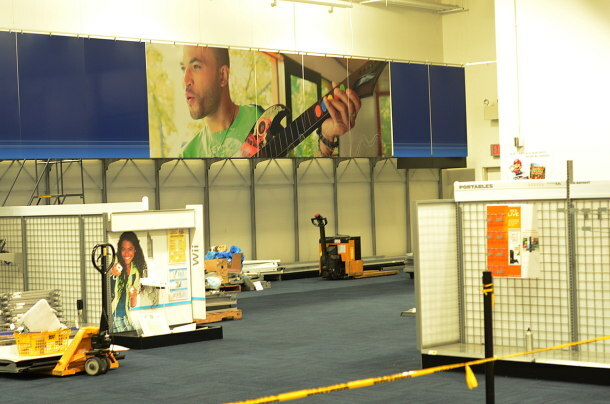 What’s more, the instrument store—an area that once sold acoustic guitars, drum sets, and recording gear—had a big sign over its door marked “clearance.” Best Buy is also phasing out the musical instrument portion of its stores. They simply can’t compete with the likes of Amazon (online advantage), Guitar Center (niche), and Sam Ash (niche). Up until a few years ago—when most movies and music moved from store racks to online—I was drawn to the rows and rows of CD’s. Why not, they sold CD’s for several dollars less than every other competitor. It’s a smart business model on the part of Best Buy. Hook the 20-something by offering cheap CD’s, DVD’s, and Games, and reel me in with the big ticket items. That model is a big reason why the company was rated #1 in America by Forbes in 2004. Fast forward to almost a decade later and we find a drastically different situation for Best Buy. The store is phasing out their CD’s and DVD’s, leaving them with an oddly cavernous space when you walk in the door. Interestingly, the store announced late last week that they would be partnering with Microsoft to open 500 mini-stores within the larger Best Buy stores. Will it fill the space? Yes! Good for business? Yet to be seen, I’ll follow up after the 2013 holiday season. Like so many other big box stores in this country (Borders, Circuit City), Best Buy finds its mega-store model on the ropes. The chain cut 50+ stores last year, and recently announced that they would be selling their 50% share of the Best Buy European market. That being said, the store is still here, and still trying to reinvent itself. As I write this post, Best Buy stock (BBY) is up, almost doubling in price since January of 2013, and they still offer great customer service with competitive prices. Circling back to my trip to the store last weekend, I ended up springing for a new camera… after they matched the local competitors price and offered a great deal on a protection plan. Can’t beat Best Buy. Could this be the next Big Box, Brick and Mortar store to fail, leaving a huge opportunity for small, online, niche businesses to fill the void? Are we better off with the Big Box stores, or should we let them fail to make an opportunity for something new to come along? I’d love your thoughts! Previous PostBack to the Future for Orchestra Musicians?